Although it’s been a very dry and hot month, the trees in the wood appear to be coping although the lowering of the pond level shows just how much the water table has gone down so they must be digging deep with their roots. All species will have been affected by this unusual summer weather but on the positive side the wood has been full of butterflies and moths, some of which haven’t been recorded there before. We’re very fortunate to have enthusiastic and knowledgeable volunteers who come to the wood to trap and record moths on a regular basis and they are always pleased to welcome people and explain what they are doing if you’re interested. Although they often have to come at short notice, due to the weather conditions, they came this month and recorded over 75 different sorts of moths of all shapes and sizes , the most interesting of which was an Ear moth. 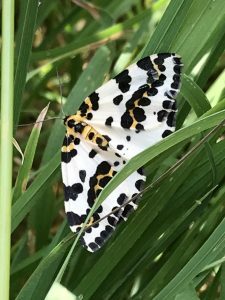 Sadly it isn’t shaped like an ear, but a new moth which was recorded, the Magpie moth, which flies during the day doesn’t look like a magpie either! Always good to have a first and it shows how the wood is encouraging more diversity as it grows. It will be interesting to see the effects of this unusually long period of drought which often aren’t apparent for months to come. Let’s enjoy the warm evenings while we can and trust to nature which is far better at adapting than we are. 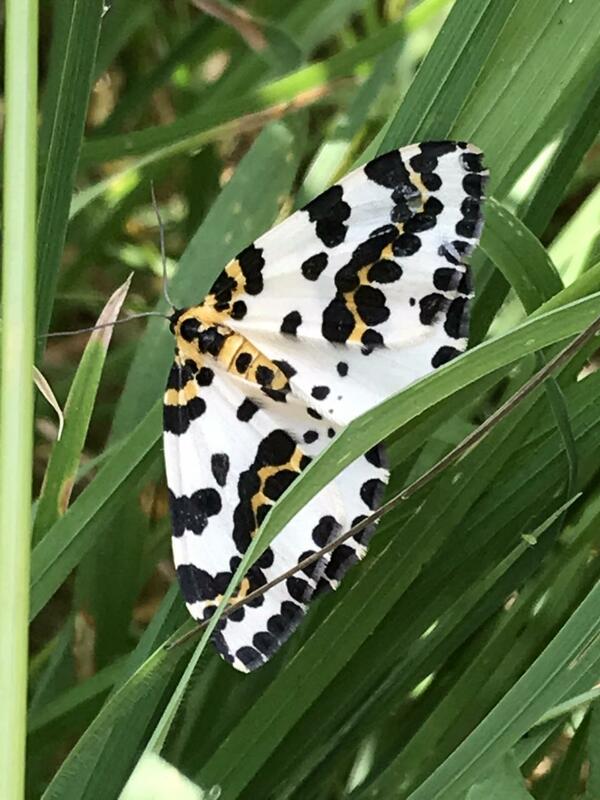 Magpie Moth caught on camera by the Woodland Wanderer.